Yup. Still on the anchovy buzz. This is a recipe I found a few months back and have made it the couple of times in between that I’ve found myself with an abundance of kale. Kale is one of my favourite brassicas (ya brasser!) but I’m not sure if they’re to everybody’s taste. They can be a little bitter, but I like to think that’s because they’re so jam-packed with millions of vitamins and yummy good stuff. This pasta takes less than 15 minutes to put together. As the kale-based sauce is not as heavy as most, it works well as a light-ish lunch or supper. I was inspired by this recipe but changed the measurements around a bit. Fill a saucepan with boiling water from your kettle and put it over a high heat. Add a pinch of salt and a drizzle of olive oil. When the water is boiling, add your pasta and cook according to its packet’s instructions. This will take between 8 and 12 minutes, depending on your pasta. Meanwhile, prepare your kale. You want to pull the leaves away from the stalks. Discard the stalks and chop the leaves until you have manageable bite-sized portions. Now wash these leaves really well in a colander and set aside. 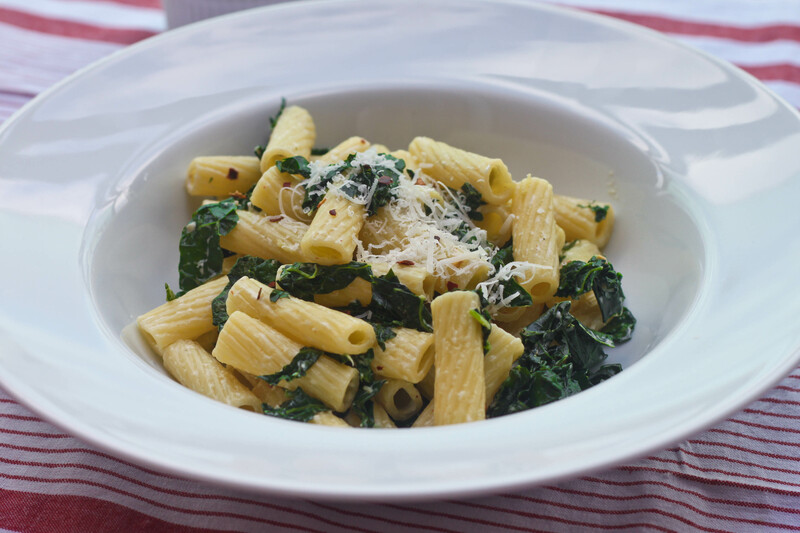 When the pasta is 6 minutes away from being finished you can get cracking on your kale-based sauce. Heat one tablespoon of olive oil in a large frying pan over a medium heat. Now chop your anchovy fillets and finely chop your garlic clove. Add to the hot pan and cook for 3 minutes, stirring constantly, until the garlic has browned and the anchovies have kind of melted. Now add the chili and kale, cooking for a further 2 to 3 minutes, until the kale starts to wilt and become tender, stirring throughout. Finally, grate in about 1/2 a teaspoon of zest from the lemon. Season the lot with a pinch or two of salt. Taste and add some more lemon or salt if you like. When the pasta is done, drain it and return it to the saucepan, off the heat. Add the 2 tablespoons of creme fraiche and mix well so the pasta is well coated. Now add the kale and anchovy mixture into the saucepan and mix well so everything gets to say hello to each other. Serve with some grated Parmesan and a crack of fresh black pepper. All that’s left to do is enjoy that lovely kale! While putting together my RTE 2xm show this week, I found this track which was released during the summer by Tamara Lindeman otherwise known as The Weather Station. Hi. Yay, kale! 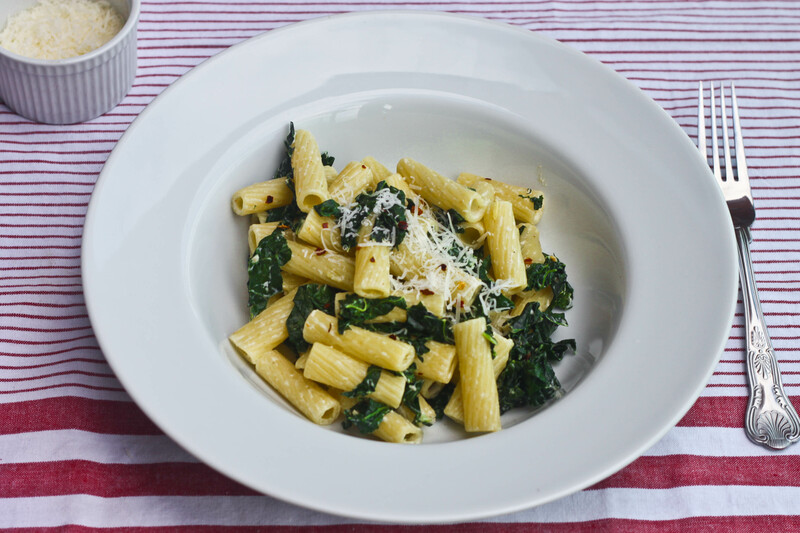 I’m doing a round up of kale recipes in a few weeks, and will include your lovely pasta! Not a unhealthy post, made it happen demand a great deal of your time and efforts to consider it?